The decision to handle payroll in-house is usually based on the need for control, flexibility and accessibility. 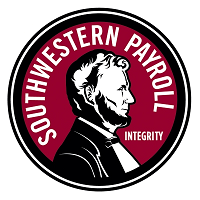 Southwestern Payroll provides the same benefits of in-house software, with the added services previously only available through a payroll outsourcing company. With the additional benefits of HR support, Southwestern Payroll surfaces as the only complete co-sourced solution. accessibility Available 24/7 from any Internet connection. Typically must be at the office to input data entry securely. HR information accessibility HR data is accessible anytime, anywhere alongside payroll data within the same database; key statistical data quickly viewable and accessible in the HR Dashboard; comprehensive employee records can include events and reminders. HR data is stored in various record-keeping vessels such as in file cabinets, spreadsheets and calendars; accessible only when in the office. federal and state tax filings and deposits Southwestern Payroll takes care of your tax filings and deposits and guarantees they are on time and accurate. Prepare filings and file manually or through separate tax authorities. Know varying due dates of tax authorities which is often based on amount of tax owed; pay extra fees when due dates missed. Or hire an accountant. security and confidential data Layers of security including server-based encryption at the hosted server facility, SSL encryption, strong user authentication. Varies from “little” to “mid-level security” based on the sophistication of IT knowledge. Typical scenario: security consists of a non-encrypted password to access the computer on which payroll data is stored, and a locked filing cabinet. paid time off Paid time off is set up on the Employee Master record and can be set to accrue and carryover automatically. Review accrued, taken and available balances for all employees at a glance. Automatic accruals and carryover typically not available. Maintain manual calculation of balances on spreadsheets. employee self-service Provides a secure portal for employees to view their own pay stubs and paid time off information, as well as make changes to personal info. May provide a portal at extra cost; typically, you field time-consuming inquiries from employees about their pay stub info and paid time off totals, and update employee information manually. HR expertise and advice Answers your HR questions from trusted HR resources. Plus access to: HR News, Articles, HR Glossary, Newsletter, HR Posters, HR Forms (state, federal and business), job descriptions, Handbook Constructor and more. Not offered. Alternative: hire employment lawyer or HR manager. reports Includes standard and popular pre-built reports; colorful charts and graphs of key statistical data; customized report writer with access to real-time data (created reports can be saved for future use); popular export formats for easy sharing; payroll allocations include miscellaneous employer costs such as insurance and retirement contributions. Standard reports. May include some charts and graphs. Limited ability to allocate payroll data. direct deposit All direct deposits are handled by Southwestern Payroll. Not offered. Typical scenario: build (and tweak) bank interface, get socked with additional bank transaction fees, get file to the bank for each payroll. preparing checks Enter data and calculate. Tax tables are always up-to-date, even local taxes. Download tax tables and forms from various tax authorities and manually update. Be aware of tax laws and which taxes may change monthly, quarterly or annually. preparing W-2s W-2s are done by Southwestern Payroll, which guarantees accuracy. Not available. Typical scenario: spend hours by the printer dealing with running out of ink or special stock, stock alignment, etc., OR hiring a third-party W-2 processing service, such as an accountant. data backup Data housed in protected facility; regular backups and duplication stored off-site. Server typically not protected from fire, flood, loss of data. Backups often stored at same facility or possibly off-site in same region. Backups not done nightly, risking days worth of work loss, and costs. new hire reporting New hires automatically reported to appropriate entity. Remember to fax information to state or report on time.